A big response to my previous blog posts about Lake Trasimeno, so I thought today I’d talk about one of our properties in that area where there are just a few July/August weeks still remaining. I went there myself many years ago and it has always been very popular with families because there are a lot of sporty activities on-site: swimming pool, table tennis, volleyball ground, tennis court, bicycle hire. It’s called Quiete and it’s located in a quiet spot just 13km from Lake Trasimeno (where there are watersports of all kinds). There are three apartments in the property and the rental price for the school summer holiday period is Euro 705 per week (approx. £625 at current exchange rate) for those sleeping 6 people, and the the one sleeping 8 is a bit more expensive. Very good value for money. Plus you have the Etruscan town of Cortona at approx 15km to satisfy any cultural requirements! You can fly from Stansted to Perugia, from where it is only a short drive to the accommodation. Lake Trasimeno: sandy beaches, sailing, wind-surfing, steamers … and Roman history! From: One Stop Italy. Bookings & Enquiries: +44 (0) 1603 812212. Lake Trasimeno – where’s that, I hear you ask? The lakes in the North of Italy (Como, Garda etc.) are very well known, and let’s face it, very commercial. Quite the opposite is true of Lake Trasimeno. The 4th largest lake in the country it lies in Central Italy, technically in the region of Umbria but in reality nestling against the border with Tuscany. What’s special about it is that it has not been spoilt. Its surface and shores were designated a Nature Reserve in 1995. There are just a handful of towns and villages around the edge, all of them small, and three islands which can be reached by steamer. So what can you do on holiday here? Well, why not hire some bikes – there’s a 50km cycle path around the lake for a start. Wind-surfing, sailing, pedalos, sunbathing on sandy beaches, fishing and swimming – yes, the water is clean enough for that too. Oh and there are hilltop castles, and for those interested in ancient history, Hannibal defeated the Romans here in 217 BC. (30,000 Romans were killed, one of the greatest military ambushes of all time). In easy striking distance for day trips you have the Etruscan town of Cortona, perched over 1600ft above the Lake, Perugia – the capital of Umbria and renowned for its chocolate production -, and of course Assisi, home to St Francis whose Basilica with its stunning frescoes is my own personal highlight. Getting there is easy too – Ryanair flies from Stansted to Perugia, so just a short drive to your holiday house once you land. 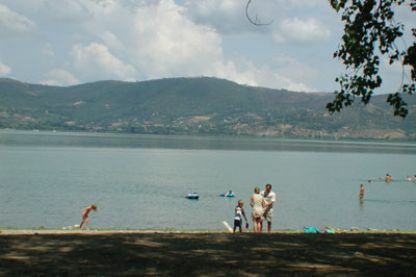 At One Stop Italy we have a large range of holiday rentals in the area around Lake Trasimeno. Inexpensive apartments – example La Casina delle Fate, where prices start at just Euro 235 per week, small villas with private pool – example Villa Susanna which has 3 bedrooms, and I Girasoli, ideal for large groups of friends and family as it sleeps 22! Lake Trasimeno – in my view, it’s a bit of an unknown gem.